Well-researched practical detail, and a good read to boot. Like being in the best sort of company. 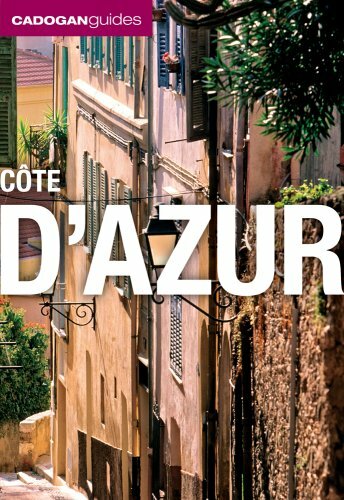 A great guide to the South of France is Cadogan’s Côte d’Azur. During the war, Matisse refused to leave France, but his home in Nice was dangerously near the city’s arsenal and he was eventually persuaded to move to Vence in 1941 to escape the coastal bombing. Some years earlier, a young woman called Monique Bourgeois had answered an advert for a 'young and pretty night nurse for the painter Henri Matisse', who was recovering from a serious operation. Later, she became a Dominican nun and was sent, by and odd coincidence, to a convent opposite the villa which Matisse had taken in Vence to wait out the war. The sisters at the convent were using an old run-down garage as a chapel, but they used to daydream about the chapel they might have one day if they could get the money together. Monique, now Soeur Jacques-Marie, showed Matisse a design for a stained glass window, which the painter promised to finance. An idea for a chapel began to develop, and with the help of a young novice priest, Frère Raysiguier, the simple Chapelle du Rosaire, built and designed by Matisse, came about. Matisse worked on the project from 1946 to 1951, by now well into his 80s and using long poles to hold his brushes when he was forced to keep to his wheelchair. He insisted on designing every aspect of the chapel, from the soaring wrought-iron cross which surmounts the tiled roof, down to the priest’s robes and candlesticks (chasuble designs and early models of the chapel can be seen in the Musée Matisse in Nice, see pp. 122-3). He considered the result his masterpiece, an expression of the 'nearly religious feeling I have for life', the fruit 'of a life consecrated to the search for truth.' The truth he sought, however, was in Christianity but in the essentials of line and light. Probably the most extraordinary thing about these decorations by the most sensual of Fauves is their lack of colour, except in the geometrically patterned stained glass windows that occupy three walls and which give the interior an uncanny kaleidoscopic glow– at its best, Matisse considered, at 11 o'clock on a winter morning when the light is less fierce. On the west wall is The Tree of Life, glowing with an intense blue, green and yellow leaf motif which the sun slants through and replicates across the plain stone altar. The altar-cloth, candelabra and crucifix are all also Matisse designs. The other walls are of white faïence from Vallauris (each tiles was personally examined by Matisse for evenness and luminosity), on which Matisse drew sweeping black line drawings of St Dominic holding a Bible, the Virgin and Child, the Crucifixion and the Fourteen Stations of the Cross. None of the figures has a face–except the face of Christ that appears on St Veronica's veil, which is exactly the same shape as the Tree of Life at the opposite end of the chapel– but they are powerfully drawn and compelling in their simplicity.